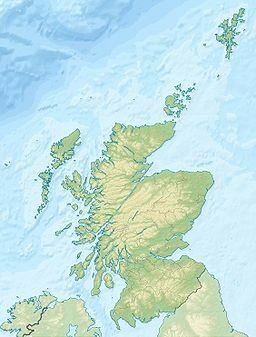 Faraid Head (Scottish Gaelic: An Fharaird) is a small peninsula on the northern coast of Sutherland, Highland, Scotland, located around 2 miles (3.2 km) north of the hamlet of Balnakeil and 3 miles (4.8 km) north of Durness. Faraid Head, Ministry of Defence range control tower for the Cape Wrath and Garvie Island military training ranges. The building was formerly a Type 80 air defence search radar station, part of the ROTOR system introduced in the UK during the 1950s. At the point is located a small radar station built in the 1950s to house a ROTOR radar system to provide radar coverage of Scotland's north coast. By the time the facility was completed however the ROTOR system had become obsolete and the station was closed down but remained in the hands of the Ministry of Defence. In later years the main building was renovated as a control tower for the Cape Wrath and Garvie Island bombing ranges. Extensive sand dunes can be found at Faraid Head which forms part of the Oldshoremore, Cape Wrath and Durness Special Landscape Area. "Faraid Head, Rotor Centrimetric Early Warning Radar Station". Canmore Record of the Historic Environment, part of Historic Environment Scotland. ^ RAF Faraid Head ('RAI') CEW R10 ROTOR Radar station, Subterranea Britannica, 2004-06-15. Retrieved 2013-02-20. ^ Assessment of Highland Special Landscape Areas Archived 2014-04-29 at the Wayback Machine, The Highland Council, June 2011. Retrieved 2013-02-05. This page was last edited on 19 December 2018, at 23:16 (UTC).